Terence Crawford take on Julius Indongo in the light walterweight unification bout on Saturday, 19th August 2017 at the Pinnacle Bank Arena in Lincoln. The winner of this fight can become undisputed light-walterweight champion with Crawford’s WBO and WBC belts while Indongo’s WBA and IBF titles are on the line. Which makes it a massive fight on the night set to be broadcasted live on ESPN in the US while SkySports will have live coverage in the UK. 34-year-old Namibian born Indongo comes with a undefeated record and his last fight was against British fighter Ricky Burns back in April 2017. Terence Crawford on the other hand already have several high profile fights under his belt and still undefeated and regarded as one of the finest up and coming walterweights in the world. 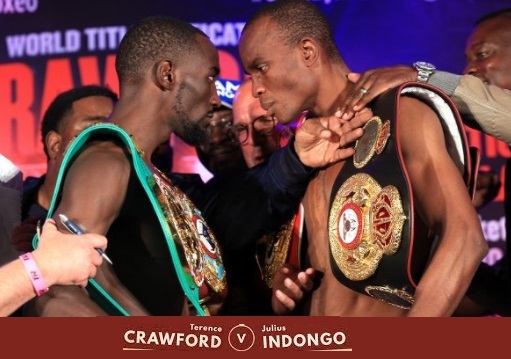 Crawford vs Indongo TV Coverage Details: ESPN will have live coverage in the US on their regular channels which means this fight and card will get alot more exposure than being on some subsciption/PPV based network. UK fans can watch the fight live on SkySports regular channels as well as warmup to next week’s PPV event between McGregor and Mayweather. The coverage will begin at around 10:00 p.m EST and there are several undercard fights on the night as well including Dillian Whyte vs Malcolm Tann, Bryant Jennings vs Daniel Martz and Oleksandr Gvozdyk vs Craig Baker. Its a very exciting card and boxing fans will be thrill they don’t have to spend anything extra to watch a unification title fight along with several good undercard fights. Dilian Whyte make his US debut and a win for him on the undercard might get a shot at some of the big heavyweights.